Giveaway Bandit to Ride in Nascar Race Car! The Giveaway Bandit, my eight year old son, is very excited to be invited to get a real race to the finish line this Saturday at the Kansas Speedway! He will be taking part in the new Richard Petty Driving Experience Junior Ride-Along program. It’s for kids ages 6 to 13 years old. This is going to be a once-in-a-lifetime experience for him and we are so glad we get to share it with all of you! Don’t worry, we’ll take plenty of photos and videos to share with our readers. Be sure to read the official press release below! Concord, NC (Oct. 2, 2013) – Richard Petty Driving Experience (RPDE), the worldwide leader in stock car drive and ride entertainment, announced today that its Junior Ride-Along program will now be available at its Kansas Speedway location in Kansas City, Kan. in addition to the Charlotte Motor Speedway location in Concord, N.C. and Daytona International Speedway location in Daytona Beach, Fla., where they launched in May; and Walt Disney World® Speedway where they have been available for more than a year. RPDE’s Junior Ride-Along program gives children ages 6 to 13 (and at least 48 inches tall) the opportunity to experience real-life racing excitement while they ride-along shotgun with a professional driving instructor for three thrilling laps in a specially equipped two-seat NASCAR race car. To build custom racing seats specifically designed to ensure the safety and security of smaller bodies, RPDE partnered with The Joie of Seating, a premier fabricator of custom-fitted aluminum racing seats, owned and operated by two-time NASCAR Nationwide series champion Randy LaJoie. These full containment racing seats feature built-in shoulder and head protection and a five-point safety harness with the same design used by NASCAR drivers. 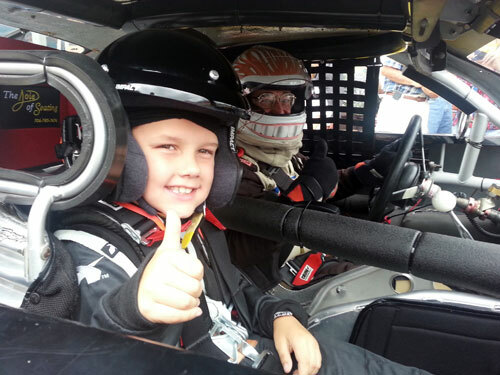 For the remainder of 2013, Junior Ride-Alongs with RPDE at Kansas Speedway are available Oct. 12-13 and 18-20, and run $59 for a three-lap ride. Reservations are not required. For more information, call 800-237-3889 or visit DrivePetty.com. Owned and operated by Petty Holdings, LLC, RPDE is the worldwide leader in NASCAR stock car drive and ride entertainment, available at more than 20 major speedways in the U.S. It has base locations in Las Vegas, Orlando, Concord N.C. and Kansas City. RPDE also produces and facilitates auto manufacturer drive and ride programs, safe driving programs, mobile marketing events and motorsports-related production services for the television and film industry. Visit drivepetty.com or call 800-237-3889 for track locations, dates of operation, or to book an experience. On Social Media, like Richard Petty Driving Experience on Facebook and follow on Twitter at @DrivePetty. This seems like it would be really cool to experience.